A fire near the Stikine River in British Columbia is continuing to grow. It’s caused the evacuation of Glenora and Telegraph Creek, the closest Canadian town to Wrangell, Alaska. But, wildfire officials are expecting progress soon. The Alkali Fire has burned almost 300,000 acres in northwest British Columbia. It was caused by a lighting strike, and discovered on August 1st. The fire is still growing, but the BC Wildfire Service declassified it as a ‘fire of note’ Wednesday morning. That means the fire is not threatening people or structures right now, and the service will give less frequent updates. “It is minimal growth to be quite honest and that’s a good thing,” said Jody Lucius, a fire information officer for the agency. She says suppression and helicopter bucketing efforts are going on, particularly north of Glenora where the fire is the worst. But the service is also demobilizing in areas, removing equipment and crew. There are 41 firefighters on the ground now. The agency has also begun efforts essential to re-entry for residents, like removing hazards left from the damage of the fire. This includes removing fallen or unstable trees that could cause further damage. But that doesn’t mean folks are returning to their homes just yet in Telegraph Creek and Glenora. “Hopefully in the next little here,[the residents can] at least to go in and see it, although they might not be able to live there for a little while yet,” said Lucius. The two towns were evacuated after the regional government declared a state of emergency. 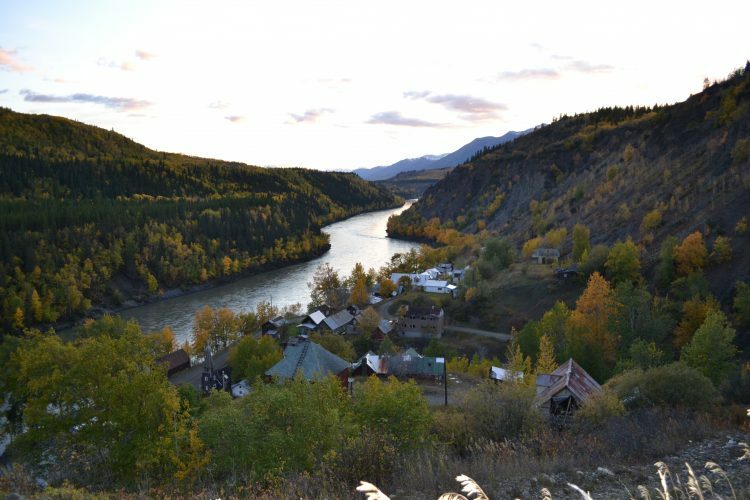 Telegraph Creek is home to under a thousand people, mostly those of the Tahltan Nation. The town is 160 miles from the Southeast Alaska city of Wrangell. Lucius says the fire received up to 12 millimeters of rain Tuesday and Wednesday of this week. And the service is expecting more rain this weekend. “We are expecting that with higher humidities and lower temperatures in the area, that the fire behavior will stay lessened and crews will be able to make some great progress,” she said. Lucius could not say what percentage of the fire is contained or how many structures have been impacted. The regional office of the BC Wildfire Service and the Tahltan Nation will conduct re-entry efforts when the service gives them the go-ahead.